Grady alumni are leaders in organizations and communities throughout the world. Keep up with a sampling of the latest alumni news here. We look forward to seeing you at our 2019 Grady Salutes: A Celebration of Achievement, Commitment and Leadership. This year’s event takes place Friday, April 26, at the Athens Cotton Gin and honors our 2019 Alumni Award winners, as well as our Fellowship and Sanford Circle inductees. Visit our Grady Salutes webpage for more details. 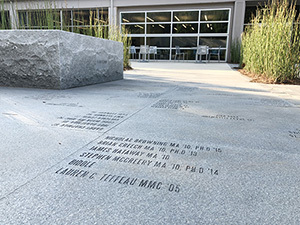 As the college moves into its next century, we invite alumni, parents of students, corporate partners and friends to leave their mark by purchasing an inscription on one of the granite pavers lining the plaza walkway and patio area along the Grady lawn. Several levels of support are available. Inscriptions purchased by or honoring students are $100. Alumni inscriptions are $150. Each 3’x 3′ paver holds up to 12 names. Pavers featuring corporate names or logos are available for $2,500. For design purposes, no text other than names and graduation years will be permitted on the pavers. We want to stay in touch with our alumni. Please let us know if you move or have a new email address by clicking the link below. We are saddened to announce the death of Al Hester who was a professor of journalism, and founder of the James A. Cox Jr. Center for International Mass Communication Training and Research from 1972 to 1997. Hester died April 11, 2019. Lee Thomas (ABJ ’87) was recognized as the 2019 Georgian of the Year by Georgia Trend magazine. Thomas is the deputy commissioner of the Georgia Film, Music and Digital Entertainment Office, heading an industry that had a $9.5-billion impact in 2017. Congratulations to Ashley ShahAhmadi (ABJ ’14) on her new role as the sideline reporter for the Charlotte Hornets. Read about her journey in this article from The Charlotte Observer. Ragan Cohn (ABJ ’96) is the 2018 recipient of the Georgia Society of Association Executives Cliff Clarke Award to the Outstanding Association Executive in Georgia. Cohn is the Executive Director, Oracle Applications Users Group at Meeting Expectations in Atlanta. Erin Abernathy (ABJ ’13) was named to Forbes’ 2019 30 under 30 marketing and advertising. She is the co-founder of Out of Office Media. Olivia Harlan Dekker (ABJ ’14) was part of the first father-daughter reporting team in NFL history. Tom Poland (ABJ ’71), author, editor and speaker received South Carolina’s highest civilian honor, the Order of the Palmetto in November 2018. Congratulations to Monica Kaufman Pearson (MA ’14) for receiving a UGA Graduate School Alumni of Distinction award. Congratulations to Amanda Mull (ABJ ’09) on her new position as staff writer at The Atlantic. She is a member of the NYC UGA alumni board. Lauren C. Teffeau (MMC ’05) has published her debut science fiction novel, “Implanted with Angry Robot,” a global science fiction and fantasy imprint. James Holland (ABJ ’54), assistant press secretary to President Gerald Ford, died on Sept. 20, 2018. Glenn Vaughan (M ’53), a member of the Grady Fellowship and former editor of the Red & Black died on Aug. 29, 2018. For those of you following the Supreme Court hearing, you may want to check out the DC Circuit Breaker blog. 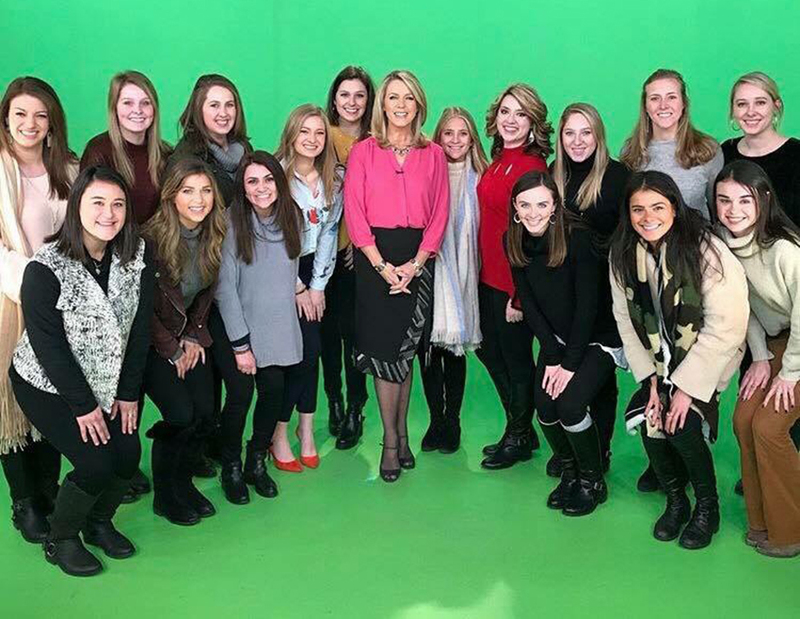 Katie Barlow (ABJ ’11) was a digital broadcast news and political science double major. She is now an attorney in D.C. She has also been interviewed several times about the hearings, including this WNYC interview. Polina Marinova (ABJ ’13) recently started a newsletter called The Profile featuring long-form stories on people and companies in business, entertainment, tech, and more curated from various sources. Monica Padman (ABJ ’09) is the co-creator and producer of the Armchair Expert podcast with Dax Shepard. After his first year as Chief Meteorologist at WIS-TV, Columbia, South Carolina, Dominic Brown (ABJ ’05), was a finalist for the South Carolina Broadcasters Association TV Weathercaster of the Year. He received this year’s second place award, the SCBA Award of Merit for TV Weathercaster of the Year. TJ Adeshola (MA ’08) was recently named Head of U.S. Sports for Twitter. He will lead all U.S. sports partnerships at Twitter, after spending the previous few years managing Twitter’s partnerships with major U.S. sports leagues, including the NFL and the NBA. Congratulations to Dejana Perić (ABJ ’17) who was recognized in AdWeek for her work on Navy Federal. She was a 2017 winner of the AEF Alfred J. Seaman Award, so was on hand at the ceremony in June to present the award to the 2018 winners. Grady expresses heartfelt condolences to the family of Tom Crawford (ABJ ’72) on his death. Read “Tom Crawford, dean of state Capitol journalist, dies at 67,” for a remembrance of his life. Ankit Desai (ABJ ’13) is CEO of Sna:fu, a 21st century music company, basked in Stockholm. Katie Barlow (ABJ ’11) recently launched Circuit Breaker, a website dedicated to providing hard-hitting, analytical news coverage of the U.S. Court of Appeals for the District of Columbia Circuit. Congratulations Capt. Richard (Rick) Wester (MMC’98) who has just been assigned as Commandant of Cadets at the U.S.Coast Guard Academy in New London, Conn., where he earned his undergraduate degree. He’s had a number of varied assignments including captain position of two ships and several PR posts. The Commandant of Cadets is the civilian equivalent of Dean of Students. Patrick Saunders (ABJ ’02) is the editor of Project Q Atlanta. Claude Felton (ABJ ’70, MA ’71), UGA senior associate athletic director, and several UGA Athletics staff members who are also Grady College alumni — Christopher Lakos (ABJ ’90), Mike Mobley (ABJ ’89), Steve Colquitt (ABJ ’89) and Leland Barrow (ABJ ’01) — were recently recognized for their work operating one of the top performing sports information departments in the country. The University of Georgia was named one of 11 schools in the country to receive the “Super 11” award presented annually by the Football Writers Association of America. This award recognizes strong media services that go the extra mile to provide help above and beyond the call of duty. Tommy Tomlinson (ABJ ’94) is profiled in Columbia Journalism Review about his fight against cancer, his start at the Red & Black and his love of feature writing. He has a new book, “The Elephant in the Room,” coming out in January 2019. Kelly Buttrick (ABJ ’94) received a StudioDaily 50 award, honoring the most influential creatives and technologists whose leadership breaks new ground in media and entertainment. Athens-based voiceover talent Kelley Buttrick was selected based on her work with a trailblazing KB4Jeep marketing campaign. Jason Kreher (ABJ ’00), Creative Director, Entertainment and Editorial at Wieden & Kennedy, has been named the Creative Director of the Year by Ad Age. Bryony Wardell (ABJ ’04) is now director of communications and marketing for University of South Carolina’s College of Hospitality, Retail and Sport Management. Kyle Wingfield (ABJ ’01) has been named president and CEO of the Georgia Public Policy Foundation. Dr. Dana Clark (ABJ ’75), professor in the Hospitality and Tourism Management program at Appalachian State University, recently received the “Winners Circle Award” at the NC 365 State Tourism Conference. Connie Book (PhD ’93) recently assumed her role as Elon University’s 9th president. Scott Williamson (MMC ’92) has been named interim vice president for advancement at College of Coastal Georgia. Jeremy Craig (ABJ ’02) was recently named Manager of Marketing and Public Relations for the Office of the Provost at Georgia State University. Inside Publications hires Patricia Duffy as new media & marketing manager. Matt Duffy (MA ’06) passed away on Jan. 17. Read the obituary. Courtney Carini (ABJ ’03), is a 2017 Knoxville Business Journal 40 Under 40 honoree. Long-time Savannah Morning News editorial page editor Tom Barton is retiring Jan. 5. With three University of Georgia degrees, Bridgette Burton (ABJ ’11, AB ’11, MPA ’17) is a Triple Dawg. She credits a Grady alumni event in Chicago with getting her involved as an alumna. She now serves on the UGA Black Alumni Leadership Council. Angela Alfano (ABJ ’10) of Tough Mudder has been named to PR News 2017 list of PR Rising Stars 30 and Under. Two Grady alumnae are part of Forbes 2018 30 under 30 lists. Congratulations to Marah Lidey (ABJ ’11), co-founder of Shine, for making the Consumer Technology list, and Lilly Workneh (ABJ ’12), senior editor for HuffPost Black Voices, for making the Media list. Journalist and writer Nathan Joseph Cain, 40, of Decatur, Georgia passed away on Nov. 9, 2017. Congratulations to Lisa Ryan Howard (ABJ ’92) on being named to The Forty Women To Watch Over 40 list . Connie Ledoux Book (PhD ’93) has been named the next president of Elon University. Robert Tate Miller (ABJ ’84) releases his new book, “The Christmas Star: A Love Story” Oct. 10 and will celebrate the debut of his movie “Love Struck Cafe” on Hallmark Channel Oct. 14. Suzanne Rutledge (ABJ ’97) has authored a new book entitled, “From the Rut to the Ledge,” which tells the story of one family’s journey to get out of their comfort zone and travel around the world. Raquel Willis (ABJ ’13) has been named to The Root’s list of the 100 Most Influential African Americans 2017. The UGA Alumni Association recently caught up with Grady Ambassador alumna 11 Alive’s Jennifer Bellamy (ABJ ’08) and her sister Lauren to talk about their University of Georgia experience. We love the shout out to Grady! Karli Barnett (ABJ’14) is part of the CBS4 morning team in Miami. Want to share some alumni-related news? 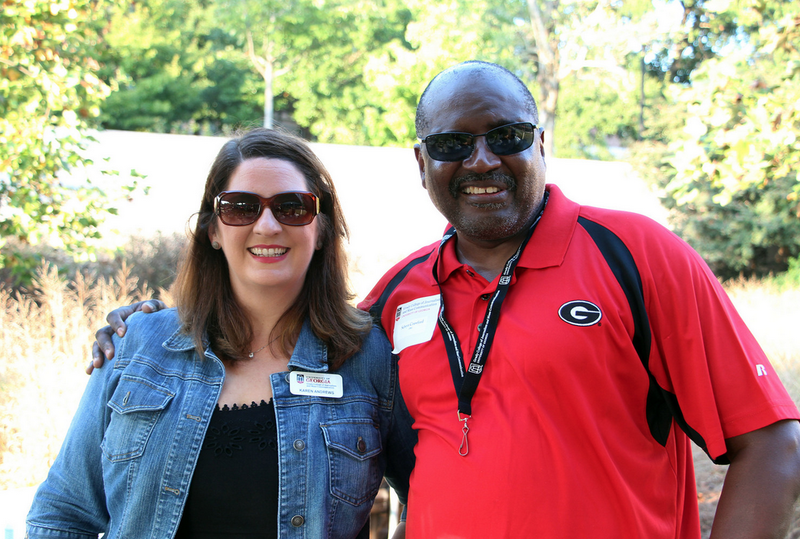 Contact Diane Murray, director of Alumni Relations and Outreach, at murrayd@uga.edu. 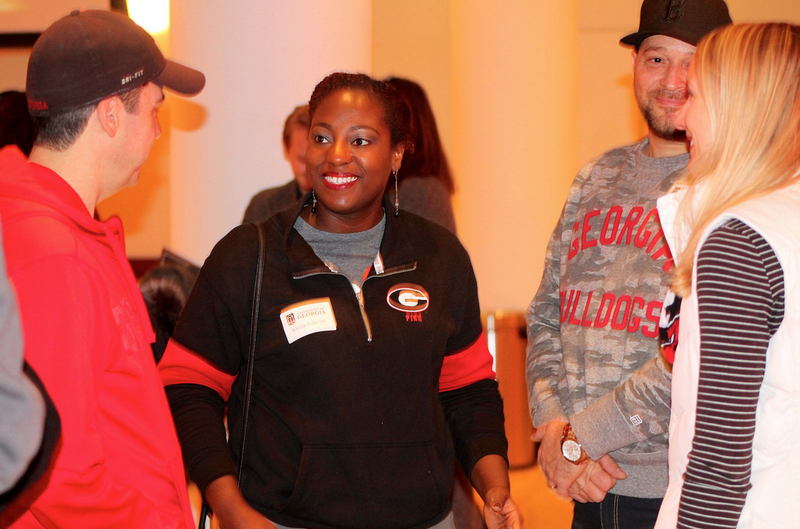 Grady College, Terry College of Business and the UGA Alumni Association co-hosted Chick-fil-A Game Day in NYC on Nov. 11, 2017 at Helen Mills Event Space & Theater. The event took place three hours ahead of the UGA-Auburn kickoff. View the photo album. Homecoming 2017 welcomed nearly 300 alumni, faculty, staff and friends to the Grady College lawn on Oct. 14, 2017. In addition to southern food from Strickland’s, guests were treated to ice cream from the Lil’ Ice Cream Dude and his mother, Vickie Shell (ABJ ’89). Photos from the day are available here. The Grady Society Alumni Board met Oct. 13, 2018. Among the highlights, were several student presentations outlining special projects. 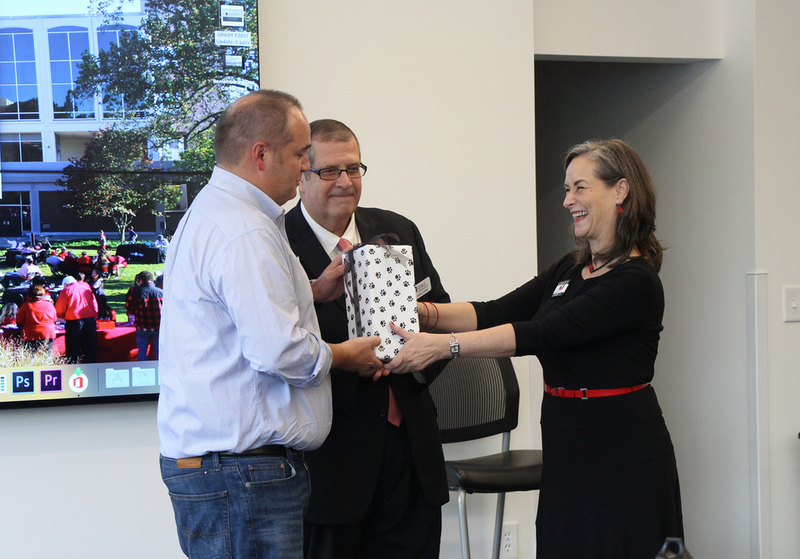 Outgoing Board Chair Bryan Harris was recognized at the end of the meeting, along with members rotating off the board. View the photos here. Keep up with more alumni news on the UGA Grady Facebook page, @UGAGrady on Twitter and join the alumni group on LinkedIn.